Here at Onit Solutions, we’re all up for a secure web. With the recent announcement of Google’s latest deadline, this time relating to the adoption of HTTPS encryption, it looks like a secure web is here to stay. Just a few months ago Google penned an article with the very same title detailing a long awaited and entirely expected update. Whether you’ve heard of Google’s HTTPS deadline with the roll out of Google Chrome 68 or not, ensuring your website is ready to hit the ground running whenever this fateful day comes (which is likely to be very soon) is important. Read on to discover just what the HTTPS deadline will mean for you and what you can do to comply with Google’s latest rules on encryption. Google Chrome holds around 56% of the global browser market share across mobile and desktop platforms and if you’re website does not have a valid SSL Certificate, any Google Chrome user who visits your website will be confronted with warning! It’s been two years in the making, and whilst rumours have been circulating about its compulsory adoption, it appears D-Day is almost here for non-secure websites that don’t use SSL certificates or HTTPS. HTTP has long been the port of call for the web design and development world. As times change and greater, more secure features become accessible, HTTPS encryption has been one thing that not just Google wants us to adopt but consumers looking for a better web experience desire. Shopping online and even browsing sites is a dangerous thing without the right protection. The underlying HTTP protocol that has been the standard for how messages are formatted and transmitted across the World Wide Web has now evolved into something bigger and better to help consumers browse and buy with confidence. It’s all too easy to forget about adopting HTTPS on your website but failing to do something that is seemingly simple to sort could have a major impact on your business’ bottom line. 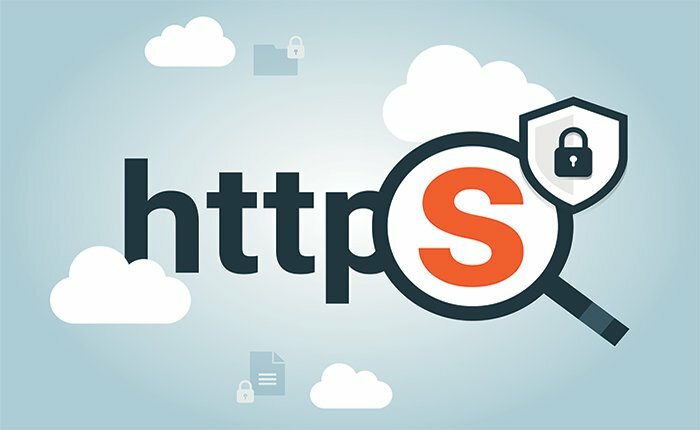 Google began to warn website owners and managers that non-HTTPS will be identified as non-secure and this information communicated with anyone who visits a website last year. These warnings will soon become a reality. We’re all familiar with the green padlock that indicates a website is secure. The HTTPS deadline however will see websites that aren’t secure clearly and formally marked as a warning to consumers. Due to be implemented at ‘some point in July 2018’, these alerts are likely to deter a browser from using your website and even buying from your business and could even push them into the arms of competitors who do have the necessary HTTPS encryption and SSL certificates in place. Installing an SSL certificate to authenticate the security of your website is just one of the easy ways you can make your website secure and abide to the impending HTTPS encryption rules. With an aim to cut cybercrime across the web and close security loopholes in browsers for good, installing an SSL certificate will not only protect your customer base but make the entire web a more secure place to do business. Need help ahead of Google’s HTTPS deadline? Let our web design and Google optimisation experts assist. Contact us today for advice and support.